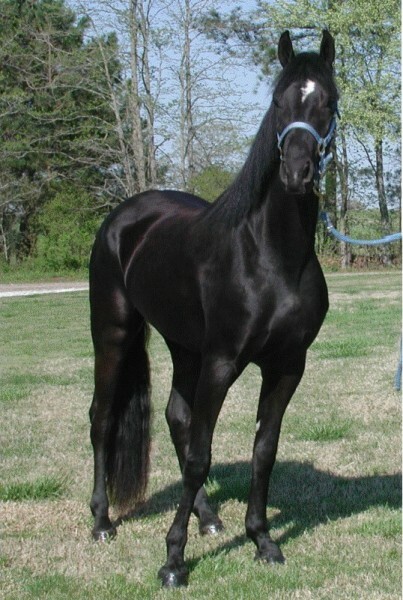 I am the proud owner of ..."FLYING W FARMS COME DANCE WITH ME" ..all Black Mare with white star on forehead.....she is absolutely gorgeous!.....her sire is Flying W Farms Koning (Friesian) & her Mom is Flying W Farms Moonlight..(saddlebred)....I just wanted you to know what a truly Special mare this is, she is very sweet, loving and is extremely intelligent to the point of being scary. She obeys my every wish and it is almost as if she can read my mind.....I am serious. She keeps her stall like no other horse I have ever known ( she only goes in 1 area) really.....all of my horse friends only wish their horses would keep their stalls 1/2 as nice). Cleaning her stall is almost a pleasure it is so easy...... Hopefully next year I can purchase another Georgian Grande! Thank you so much for creating this extremely special mare! I hope to purchase another special horse from you in the future. Adair is truly a DREAM HORSE...and very, very affectionate........everyone that meets her falls in love with her. THANK YOU!